I decided I had to try this! I did make this without a cast iron skillet. I used square glass Pyrex dish lined with aluminum foil (easy clean-up). Also, this makes a lot so be prepared to share with a group. • 1 baking dish lined with aluminum foil. Directions: Pre-heat PAN in the oven to 450 degrees. Take pan out of oven and pour chocolate evenly on the bottom. 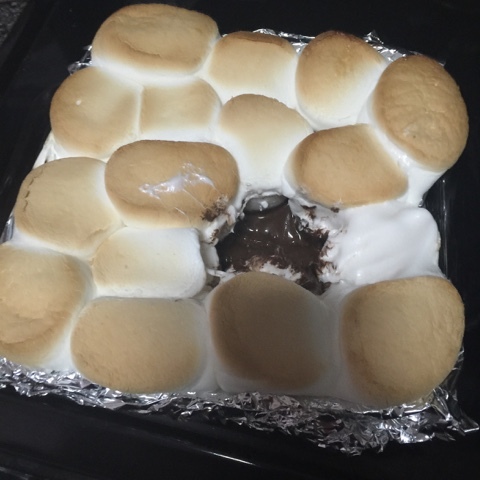 Place 1 layer marshmallows on the top. Cook for 5 to 6 minutes or until marshmallows have turned golden brown. (You need to watch it because it can easily over cook) Take out of oven, serve with graham crackers.